Inside a State Park in Washington history is being made, as WWO’s Citizen Science team undertakes to photograph, film and track gray wolves who have been moving through the Park. 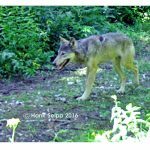 Project Coordinator and Citizen Scientist volunteer, Hank Seipp, recently captured the above photo of a gray wolf, the first image of a gray wolf taken inside the Park. By recruiting and engaging citizen scientists in identifying and monitoring Washington State’s endangered gray wolf population, we hope to learn more about their movements and raise awareness of their presence and their behavior. We will be engaging visitors to Spokane State Park and elsewhere, explaining that they really have nothing to worry about. Wolves are very reclusive and human-averse; the least dangerous of all the large carnivores. Dogs in State Parks are to be kept on leashes, and this is always a good safety precaution for your pet, especially when wolves or other large wildlife such as moose and/or elk may be present. We also plan to see that all our citizen scientist volunteers are given the opportunity to receive training in how to keep an eye out for poaching and other illegal activities through the successful “Eyes in the Woods” training offered sponsored in part by the Washington Department of Fish and Wildlife. Our staff are all certified “Eyes in the Woods” practioners. “Eyes in the Woods” training provides techniques to monitor for misuse of public lands and wildlife. Poaching of wildlife hurts us all. We provide training to our volunteers in tracking techniques as well as how to use remote cameras, identify tracks and record data to add to the scientific knowledge base of Washington’s endangered wolves. Better knowledge of wolf presence and activity will equally benefit those raising domestic animals, recreationists, wildlife and land managers. Western Wildlife Outreach and our citizen scientists have a pressing need to purchase and deploy additional remote cameras capable of taking videos and sending the information back to computers being monitored by WWO. We need funds to reimburse for travel and vehicle wear and tear as well as helping to fund a part-time project coordinator to oversee our team of dedicated citizen scientists. We need funds to put on training workshops for our volunteers. You can be part of the ongoing story of Washington’s gray wolf recovery. Your donation of $250.00 will help purchase and deploy one new wolf-monitoring camera. $500.00 will fund an “Eyes in the Woods” training session for interested citizen scientists. Every donation no matter the amount, is important. Give what you can today. Every dollar you give goes to the project, not to overhead! The team at Western Wildlife Outreach thanks you in advance for your support. We can do this together!